Water scarcity and environmental costs of fertilizers production, requires the optimization of its use in vegetal production. Our Mediterranean environment’s soils are poor in organic matter, essential to maintain their structural balance and to ensure sustainable productions, as well as it preserves the agricultural ecosystem. Mineral origin fertilizers production involves a high ecological cost. 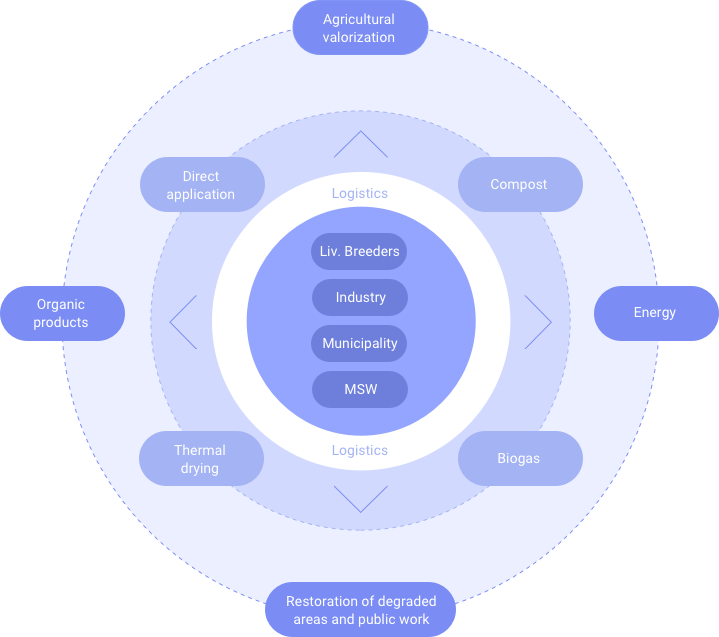 On the other hand, human activity generates waste materials containing organic matter and nutrients, that could be reused in substitution of fossil or mineral fertilizers. This recycling should be done with full guarantees to society. When recycling is possible, an extraordinary mechanism of resources saving is activated; It is pure circular economy. Muns has always been aware and promoter of this valorization philosophy, and has invested the last 20 years in the agricultural good practices dissemination and implementation. We have endowed ourselves with our own measurement processes, control and fulfilment of performance standards, traceability assurance, regulatory compliance, agronomic benefits and, indirectly, social ones. It’s this social consciousness which defines and distinguishes our way of working. Our commitment to agriculture and ecology, determines the protection of environmental interests, and the preservation of our customer’s brand and reputation.